Red dot finders are popular among astronomers. 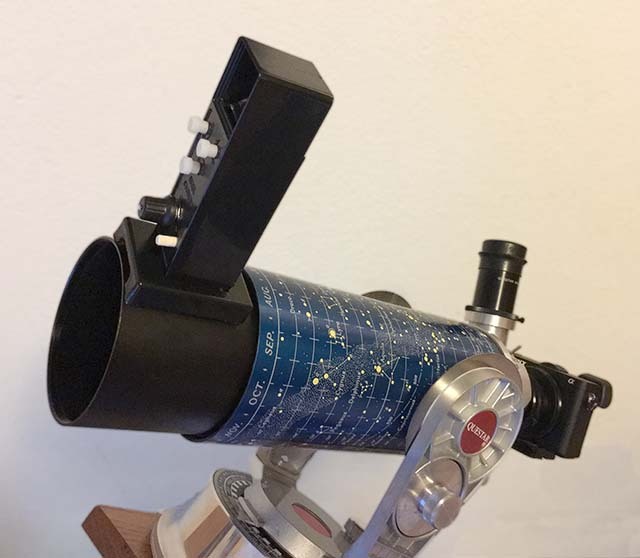 The built in Questar finder is always at hand, but doesn't have the direct, red dot, connection to the sky overhead. The Questar is a jewel of functional precision with no space wasted. Mounting a red dot finder without risking damage to a gleaming surface or making the scope difficult to store away is nearly impossible. Many red dot finder fans settle for temporary mountings with elastic bands, but these are not precise and require finder realignment. The Questar's front filter / lens cap is a standard 95mm camera thread. This allows not only standard camera UV and Polarizing filters to be fitted to the Questar, but also threaded lens hoods. I found that an inexpensive 3" long 95mm aluminum lens hood makes a great platform for mounting a red dot finder. It is large enough for any finder to be mounted on it including dovetail, clamp on, and double sided tape mountings. There is no possibility of damage to the telescope. The 95mm screw on mounting allows the finder to easily be removed for storage and reattached precisely. The image above shows one of Tony Costanzo's modified, clamp on, red dot gun sights mounted on the lens hood. 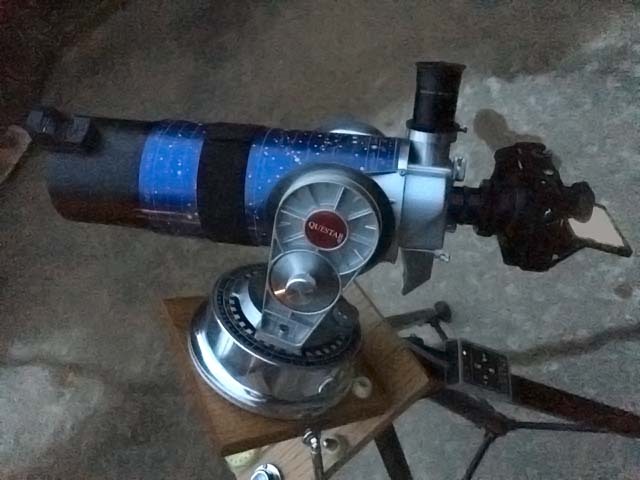 There is also plenty of room for my Rigel QuickFinder and I suspect most other telescope finders. Attaching your favorite finder to the lens hood is easy. With the lens hood screwed on your Questar, mark the position where you want the finder mounted. Remove the lens hood, to drill holes for a dove tail, apply mounting tape, or clamp on your red dot finder. 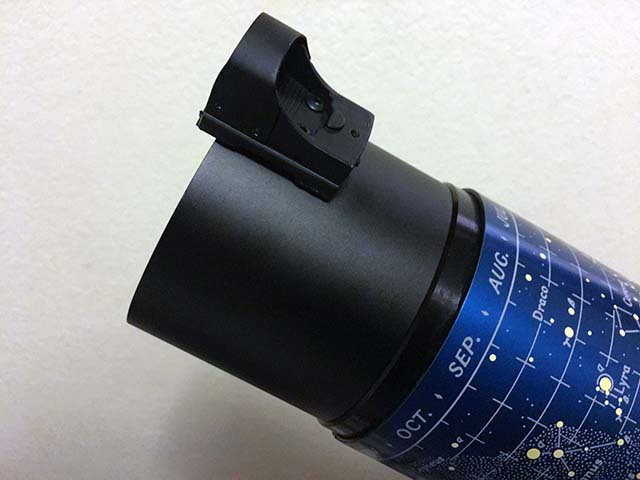 Once the finder is mounted, screw the lens hood back on and align the finder optics with the telescope. You can now easily unmount the finder with the lens hood for storage and precisely reattach it later. The finder and lens hood look great mounted on the Questar. The 3" lens hood functions as the Questar's dew cap leaving the original dew cap in place on the barrel to function as a star map. Above is the 3" lens hood with a Rigel Systems QuickFinder mounted. Not as compact as the gun sight, but one of the easiest to use astronomical relex finders.